The season of unashamed lager drinking approaches, ever so slowly. There are rumours on the wind that Summer might happen this year. The rituals of purchasing shorts that actually fit us, insisting to everyone that we're definitely going to do a lot of barbeques this year, and the ceremonial beheading of goats to please the sun god are all taking place across the nation. Lager looms over this portended season of beer gardens and being able to get away with wearing a hat. Let Hog's Back Brewery's All 4 One lager be dragged to the altar and tested, while we wait for the goat to arrive. A playful, floral, sparkling scent is unleashed by the bottle opener. Crisp, flowery greenery. A brisk and bright meadow scent. Untamed and undisciplined wild flowers amid long grass. The scent of what we know will be a fleeting, 330ml of Summer. The glass is filled by beer the colour of dry straw, and upon this bedding lands a thin head of white foam; dissipating almost instantly but still evidence that not every beer from this range is completely headless from the get-go. The carbonation appears wild, blurring into little bubbly lift shafts, shooting skyward like the sparks of the Quickening. On setting the glass down after its had its moment in front of the camera, the head reappears, returned to life on the rising pillar of carbonation, so maybe that Highlander reference in the previous sentence was entirely called for. The first taste is disparate bitterness, as elements of the flavour profile scrabble over each other to be the first on the tastebuds. The honeyish notes are deeper than the label's "a touch of honey" suggests, lasting well into the aftertaste. Elsewhere there is mixed and muted citrus, a lemony sensation vibrating through the skinny mouthfeel. 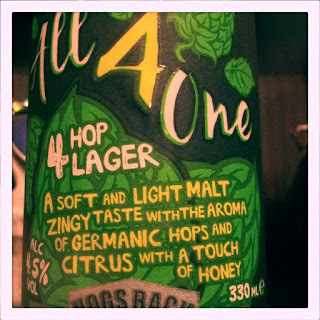 Despite the presence of four varieties of hop there isn't any real skew of the flavour in a wild direction. It's a simple, Germanic lager beer, a clean and easy drinking palate cleanser, There's no wild complexity to the taste but there doesn't really need to be. The taste gets a little fruitier with only half a finger remaining in the glass. Juiciness has had time to build up, green and yellow on the senses as the glass empties and the urge to crack another bottle rises. There is a feeling of satiation and satisfaction, like premature accomplishment following a hard fought day that hasn't happened yet. Honey sweetness is the last sensation to disappear, as Summer comes closer by the second.